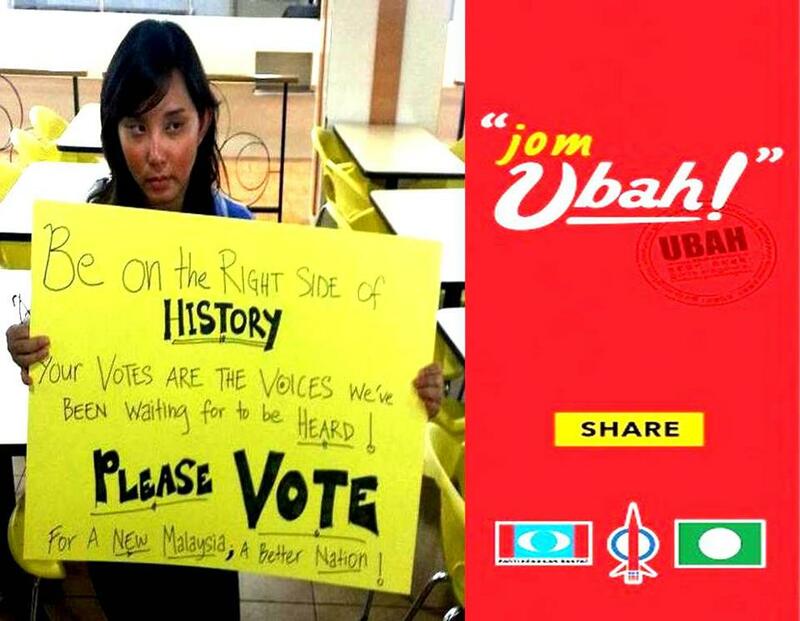 Vote for Pakatan or Barisan Nasional? GE13, PRU13. Thanks to RC who created the poster above for me to upload. I have never been fond of politics. I am a person who enjoys her time of peace, serenity, sometimes on her own, and sometimes with her mates. But 33 years of living on this Earth has taught me a few things. In particular, going overseas to study in a country like Australia has opened my eyes. As they say in cantonese, 'hoi har ngan kai', or open your eye view. What I really marvelled about my time in Australia is seeing how open the people are with their opinions. I remembered watching representatives from three different parties, Liberal, Labour, and the Greens on an australian channel broadcasted live on cable Astro. Though they were all from different parties, but their main concern was the people when fielded with questions on single mothers, environmental sustainability, and taxes. The first thing that came to my mind was when will we see that happen in Malaysia? When can I see the current Barisan Nasional political leaders actually listening to the concerns of the people, regardless of their race, gender, and religion? When can I see the rakyat questioning the people in authority, or having media like The Star, and New Straits Time reporting transparently without biasness of the Opposition? Are the editors in these newpapers wussies? One of the things that seems to be a hush-hush topics is access to higher education. I am really blessed and fortunate to have a family who can finance my studies to go abroad. But what about others who are not able to do so? I read story after story of students who perform well in their academic studies, but are refused a place at the local university due to their non bumiputra ethnic heritage. When I tell this to my mates from Australia, or South Korea, they are shocked? appalled? at how the government in Malaysia treats their local rakyat. In Australia, regardless of whether you are Caucasian, or Asian, everyone has equal access to university. Access to university is dependent on how well one does in their Year 12 studies (equivalent to A Levels Malaysia), and is based on meritocracy. All citizens are able to apply for a loan to finance their studies. But does that apply to us rakyat in Malaysia? I do not think it is possible under our current governmental body. These up and coming rakyat are the future generations of Malaysia, and not assisting them to have an education would lead to a brain drain of skilled employees to places like Singapore, and South Korea, as is happening now. First I feel betrayed when I see Barisan Nasional splashing ads in papers like there was no tomorrow. The money used for campaigning are the tax payers money, and it would be put to better use if given back to the rakyat. How much of the taxpayers money are actually being used back on them? Do you think periodically giving Rm500, and packets of rice is enough? I dont really care to list the atrocities done by our govt.. It gives me a headache.. But you can read about it in the links listed below. Second, I hear that ads made by Barisan Nasional are flouting intellectual copyright. Apparently there was one bunting they put that belongs to a married couple. The picture whom they took belongs to the bridegroom, whom they have transposed the image of another lady over the bride. They have done this without seeking permission from the owner of the photo. In my mind, they are encouraging dishonesty in intellectual property, where they are encouraging stealing without seeking permission. What does this small act tells you of our current Barisan Nasional party? Some people are wondering about the passing of Hudud law by PAS in parliament. They do it to the extent of saying that because as Christians, we should discourage anything which is not Christian. Granted, I am a Christian myself. However I find this tactic used by Barisan Nasional to frighten the rakyat as petty. Accordingly from what I have read, PAS is contesting only 73 of 222 parliamentary seat. Assuming if they win all,they still have less than 1/3 of the seats. In Parliament, they need at least 2/3 of the seats to change the law. Hence this element of 'passing hudud law' is negligable. Do you know what Hudud Law is like? Its like in days of Abraham, Jacob and Isaac where people had their hands chopped off for stealing. I really doubt any of the other parties would agree to such implementation. The biggest stealers, siphoning funds to secret accounts in Swiss Banks should be the first to go. I wonder who these guilty parties are? Which Party will I vote for? To me, I vote for the party which has demonstrated themselves worthy of my vote. Leadership in the country in not by debasing and telling others how much the rakyat has to lose if they vote for the Opposition. It is through display of effective management of social issues, problems, funds, and listening to the pleas of the rakyat. Flaunting your extravagant and expensive taste in handbags, showing your desperation to be an eager recepient of an honorary degree from a foreign university, not to mention having disputable truths of your work in charitable organisations shows bad taste and PR in the media. The rakyat are a discerning bunch, and they can see when they are being taken for a ride. 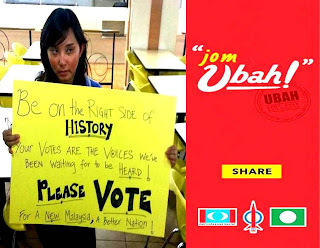 To the rakyat, make the right choice. We do not know what the future holds, but change we must.